1 A None No Power Seat 1 A is a standard Business Class seat whose proximity to the lavatory and galley may be bothersome. There is no floor storage for this seat during takeoff and landing. The tray table and video monitor is in the armrest, making the armrest immovable and slightly reducing seat width. A bassinet is available at this location, therefore, a passenger traveling with an infant might be seated in this row. 1 C None No Power Seat 1 C is a standard Business Class seat whose proximity to the lavatory and galley may be bothersome. There is no floor storage for this seat during takeoff and landing. 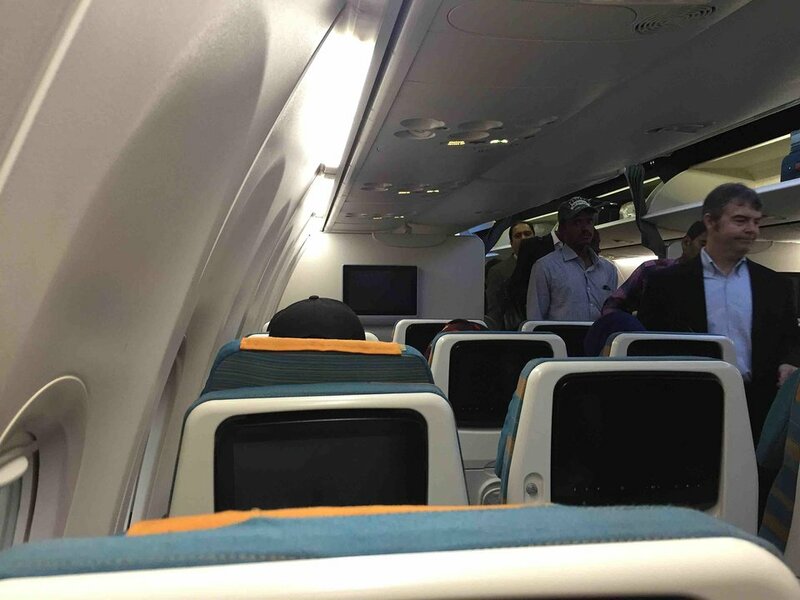 The tray table and video monitor is in the armrest, making the armrest immovable and slightly reducing seat width. A bassinet is available at this location, therefore, a passenger traveling with an infant might be seated in this row. 1 D None No Power Seat 1 D is a standard Business Class seat whose proximity to the lavatory and galley may be bothersome. There is no floor storage for this seat during takeoff and landing. The tray table and video monitor is in the armrest, making the armrest immovable and slightly reducing seat width. A bassinet is available at this location, therefore, a passenger traveling with an infant might be seated in this row. 1 F None No Power Seat 1 F is a standard Business Class seat whose proximity to the lavatory and galley may be bothersome. There is no floor storage for this seat during takeoff and landing. The tray table and video monitor is in the armrest, making the armrest immovable and slightly reducing seat width. A bassinet is available at this location, therefore, a passenger traveling with an infant might be seated in this row. 10 A None No Power Seat 10 A is a standard Economy Class seat that has limited legroom. There is no floor storage for this seat during takeoff and landing. The tray table is in the armrest, making the armrest immovable and slightly reducing seat width. A bassinet is available at this location, therefore, a passenger traveling with an infant might be seated in this row. 10 B None No Power Seat 10 B is a standard Economy Class seat that has limited legroom. There is no floor storage for this seat during takeoff and landing. The tray table is in the armrest, making the armrest immovable and slightly reducing seat width. A bassinet is available at this location, therefore, a passenger traveling with an infant might be seated in this row. 10 C None No Power Seat 10 C is a standard Economy Class seat that has limited legroom. There is no floor storage for this seat during takeoff and landing. The tray table is in the armrest, making the armrest immovable and slightly reducing seat width. A bassinet is available at this location, therefore, a passenger traveling with an infant might be seated in this row. 10 D None No Power Seat 10 D is a standard Economy Class seat that has limited legroom. There is no floor storage for this seat during takeoff and landing. The tray table is in the armrest, making the armrest immovable and slightly reducing seat width. A bassinet is available at this location, therefore, a passenger traveling with an infant might be seated in this row. 10 E None No Power Seat 10 E is a standard Economy Class seat that has limited legroom. There is no floor storage for this seat during takeoff and landing. The tray table is in the armrest, making the armrest immovable and slightly reducing seat width. A bassinet is available at this location, therefore, a passenger traveling with an infant might be seated in this row. 10 F None No Power Seat 10 F is a standard Economy Class seat that has limited legroom. There is no floor storage for this seat during takeoff and landing. The tray table is in the armrest, making the armrest immovable and slightly reducing seat width. A bassinet is available at this location, therefore, a passenger traveling with an infant might be seated in this row. 20 A None No Power Seat 20 A is a standard Economy Class seat that has limited recline due to the Exit Row behind it. 20 B None No Power Seat 20 B is a standard Economy Class seat that has limited recline due to the Exit Row behind it. 20 C None No Power Seat 20 C is a standard Economy Class seat that has limited recline due to the Exit Row behind it. 20 D None No Power Seat 20 D is a standard Economy Class seat that has limited recline due to the Exit Row behind it. 20 E None No Power Seat 20 E is a standard Economy Class seat that has limited recline due to the Exit Row behind it. 20 F None No Power Seat 20 F is a standard Economy Class seat that has limited recline due to the Exit Row behind it. 21 A None No Power Seat 21 A is a standard Economy Class seat that has additional legroom, however, has limited recline due to the Exit Row behind it. There is no floor storage for this seat during takeoff and landing. The tray table and video monitor are in the armrest making the armrest immovable, therefore, slightly reducing seat width. 21 B None No Power Seat 21 B is a standard Economy Class seat that has additional legroom, however, has limited recline due to the Exit Row behind it. There is no floor storage for this seat during takeoff and landing. The tray table and video monitor are in the armrest making the armrest immovable, therefore, slightly reducing seat width. 21 C None No Power Seat 21 C is a standard Economy Class seat that has additional legroom, however, has limited recline due to the Exit Row behind it. There is no floor storage for this seat during takeoff and landing. The tray table and video monitor are in the armrest making the armrest immovable, therefore, slightly reducing seat width. 21 D None No Power Seat 21 D is a standard Economy Class seat that has additional legroom, however, has limited recline due to the Exit Row behind it. There is no floor storage for this seat during takeoff and landing. The tray table and video monitor are in the armrest making the armrest immovable, therefore, slightly reducing seat width. 21 E None No Power Seat 21 E is a standard Economy Class seat that has additional legroom, however, has limited recline due to the Exit Row behind it. There is no floor storage for this seat during takeoff and landing. The tray table and video monitor are in the armrest making the armrest immovable, therefore, slightly reducing seat width. 21 F None No Power Seat 21 F is a standard Economy Class seat that has additional legroom, however, has limited recline due to the Exit Row behind it. There is no floor storage for this seat during takeoff and landing. The tray table and video monitor are in the armrest making the armrest immovable, therefore, slightly reducing seat width. 22 A None No Power Seat 22 A is a standard Economy Class seat that has additional legroom due to the Exit Row. There is no floor storage for this seat during takeoff and landing. The tray table and video monitor are in the armrest making the armrest immovable, therefore, slightly reducing seat width. 22 B None No Power Seat 22 B is a standard Economy Class seat that has additional legroom due to the Exit Row. There is no floor storage for this seat during takeoff and landing. The tray table and video monitor are in the armrest making the armrest immovable, therefore, slightly reducing seat width. 22 C None No Power Seat 22 C is a standard Economy Class seat that has additional legroom due to the Exit Row. There is no floor storage for this seat during takeoff and landing. The tray table and video monitor are in the armrest making the armrest immovable, therefore, slightly reducing seat width. 22 D None No Power Seat 22 D is a standard Economy Class seat that has additional legroom due to the Exit Row. There is no floor storage for this seat during takeoff and landing. The tray table and video monitor are in the armrest making the armrest immovable, therefore, slightly reducing seat width. 22 E None No Power Seat 22 E is a standard Economy Class seat that has additional legroom due to the Exit Row. There is no floor storage for this seat during takeoff and landing. The tray table and video monitor are in the armrest making the armrest immovable, therefore, slightly reducing seat width. 22 F None No Power Seat 22 F is a standard Economy Class seat that has additional legroom due to the Exit Row. There is no floor storage for this seat during takeoff and landing. The tray table and video monitor are in the armrest making the armrest immovable, therefore, slightly reducing seat width. 38 A None No Power Seat 38 A is a standard Economy Class seat that is in the last row of the plane and has limited recline. The proximity to the lavatories and galley may be bothersome. 38 B None No Power Seat 38 B is a standard Economy Class seat that is in the last row of the plane and has limited recline. The proximity to the lavatories and galley may be bothersome. 38 C None No Power Seat 38 C is a standard Economy Class seat that is in the last row of the plane and has limited recline. The proximity to the lavatories and galley may be bothersome. 38 D None No Power Seat 38 D is a standard Economy Class seat whose proximity to the lavatories and galley may be bothersome. 39 D None No Power Seat 39 D is a standard Economy Class seat that is in the last row of the plane and has limited recline. The proximity to the lavatories and galley may be bothersome. 39 E None No Power Seat 39 E is a standard Economy Class seat that is in the last row of the plane and has limited recline. The proximity to the lavatories and galley may be bothersome. 39 F None No Power Seat 39 F is a standard Economy Class seat that is in the last row of the plane and has limited recline. The proximity to the lavatories and galley may be bothersome. Oman Air offers a variety of audio entertainment features. 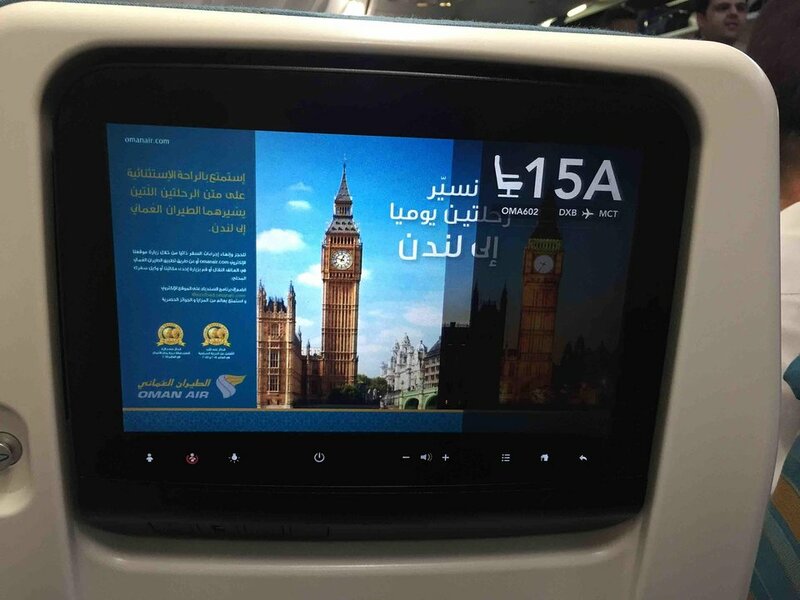 Oman Air offers a variety of video entertainment features. Selections range from comedy programs and sport documentaries to feature films. 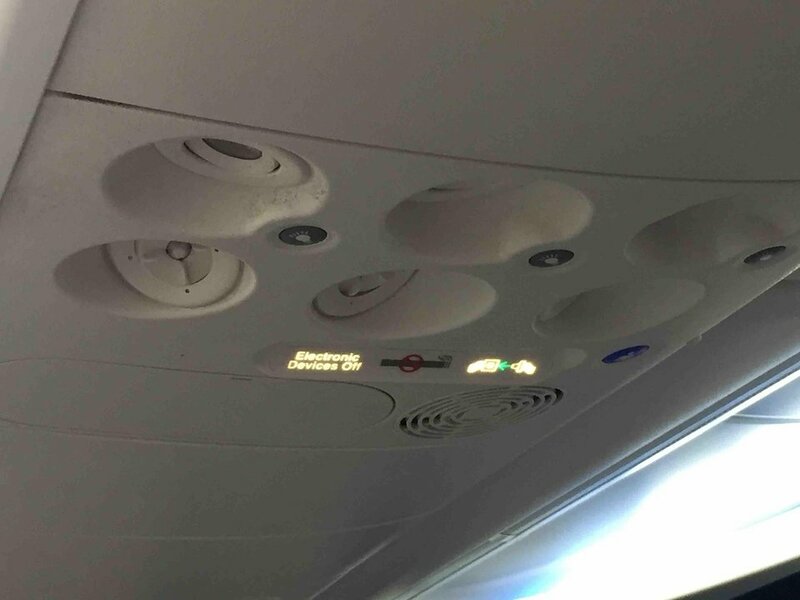 Some features are available only on selected flights. All seats in Business Class have power outlets. All seats have USB power ports which may be used for recharging mobile devices. Complimentary coffee, tea, juice, and soda are served on most Oman Air flights. A selection of alcoholic beverages are complimentary in Business Class and available for purchase in the Economy Class cabin. A variety of snacks or meals are served on select flights. Visit omanair.com and select Flying With Us to access additional information regarding inflight dining for your selected class. Oman Air Boeing 737-900's are powered by CFM engines and are configured in a very comfortable two class configuration of 12 Business Class seats and 171 Economy Class seats. 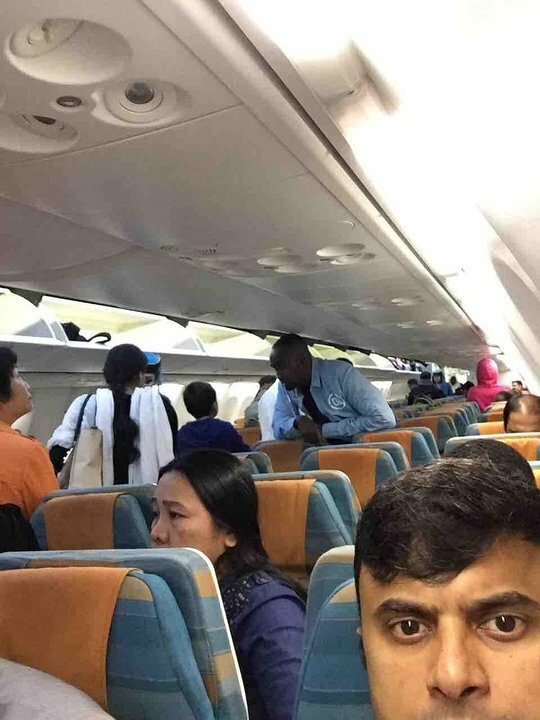 Business is ok, but once flying in economy and must say that there are only 2 toilets for 171 passengers, not enough. Business class toilet is very small. I hate this plane!!! Never will fly for long distance by this version. Just beside the engine air inlet. Not to noisy. Lot of Space for the legs. No toilet in front, neither kitchen. Ideal for a restful flight. Tested during a 3h50 flight. Subject to Oman Air optional fee for raw 10. 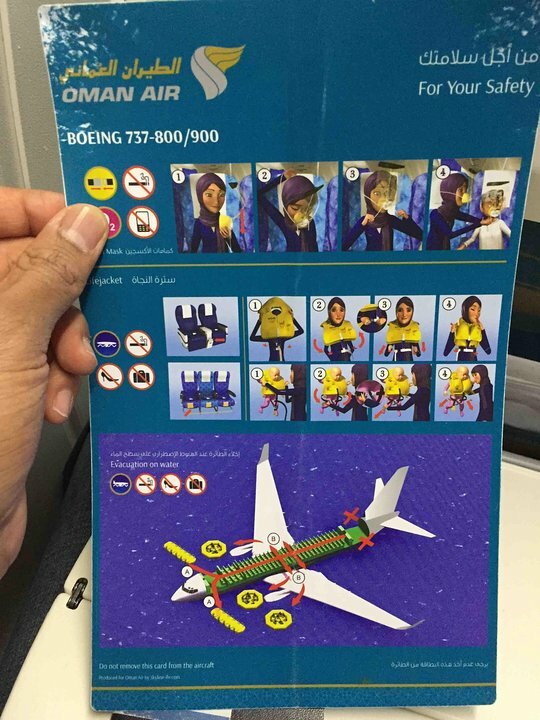 Oman Air flies 1 versions of Boeing 737-900.